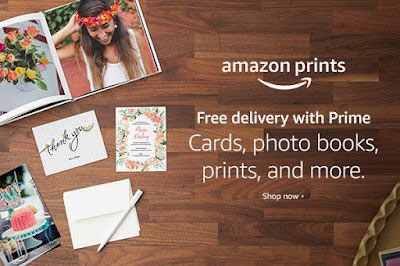 I am so excited to tell you guys about a new service from Amazon called Amazon Prints! Amazon Prints is the easy way to print your memories! It's so simple! Here's the deal! All you do is upload your photos to your Prime Photos account, print the product of your choice, and get free delivery! If you’re not a Prime member, you’ll receive 5 GB of storage free on Prime Photos and be able to print your favorite photos. Prints start as low as $0.09, so it's super affordable! I LOVE the idea of this new service! Now, I can get large canvases, photo calendars, cards, photo gifts and more, all with the click of a mouse. Love it! You can check out Amazon Prints for yourself by clicking here! This is going to revolutionize the way that people order photos, cards and more, and I am really excited about that. Plus, Amazon is giving away tons of gift cards to help people get used to their new service! Check out their awesome giveaways below! Thanks to Amazon for sponsoring this post and providing prizes for the giveaway!Amazon, Fire and the Amazon Fire TV logo are trademarks of Amazon.com, Inc. or its affiliates.